The thing is that every single person at the gym had their "first day" at some point in their lives. Those people who look like they know exactly what they are doing were once newbies and had to learn how to properly set up the equipment just like you. So give it time and try these tips to conquer your gym intimidation. 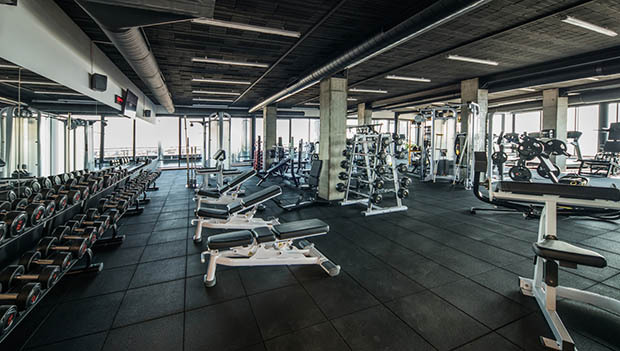 Find the right gym for you. There are so many gym options out there right now. Finding one that fits your budget and fitness needs should be the top priority, because it will help motivate you to work out. From boutique gyms that offer small classes and a trainer directing the participants to large chain gyms that offer strength, cardio and multiple daily classes, there's something for everyone. Any good gym will have a new member orientation program that allows you to use the facilities free of charge (or at a discounted rate) for a short period of time. A trainer will take you to every piece of equipment and show you how to set it up, and they'll also give you a general introduction to how the facility operates and different perks and programs they offer. Utilize the orientation programs at a few gyms near you before you pick the one to join long-term. This will help you learn what you like and don't like and the type of gym where you'll be most comfortable. If your budget allows, sign up for a few personal training sessions at your favorite gym(s) to really give your workout confidence a boost. Don't worry about feeling like others are watching you. My objective at the gym—get in, get my workout done, get out. That's how the majority of us feel. We don't have time to watch others. Besides, most peeps are checking out their own #gainz in the mirror, not anyone else. Know that not everyone knows what they are doing. Even those who have been working out in gyms for years still don't know everything. There will always be new equipment coming out that even the veterans don't know how to properly use. Also, don't assume someone who looks like they've been working out for years is using the equipment correctly. Know what you want to do from start to finish before you head to the. Write it down or save it to your phone. YouTube, Instagram and Pinterest are all great sources of workouts to give you examples of exercises and even full training sessions. Start going during off-peak hours. When first starting out, try hitting the gym during off-peak hours (usually mid-morning, mid-afternoon or after 7 or 8 p.m.) when it's a little less crowded. You can take your time on the machines without feeling rushed. Take a group exercise class. Group exercise classes are a great intro to exercise and the gym. There's safety in numbers. It may be tempting to find a spot in the back row to blend in, but be sure to let the instructor know that it's your first time. They can offer up modifications if need be and explain any new moves. As you get more comfortable, you may find yourself moving on up to the front row. Just like there's safety in numbers in a group exercise class, having a workout buddy can help you feel less intimidated at the gym. Tag along with a friend who has gym experience to show you the ropes. Or find a friend who is a newbie too, and you can learn together.